The Institute for Democratic Governance (IDEG), a research and advocacy think tank is advocating the amendment of Article55 (3) of 1992 constitution to remove the prohibition against political parties in local governance. Article 55(3) states that “subject to the provisions of this article, a political party is free to participate in shaping the political will of the people, to disseminate information on political ideas, social and economic programmes of a national character and sponsor candidates for elections to any public office other than to District Assemblies or lower local government units’’. This Article is entrenched meaning that its amendment requires public approval in a national referendum. There are two processes involved. The first should take place this year, 2018 and the second in 2019. In 2018, the parliament and executive have to work together to amend Article 55(3) by agreeing on the amendment bill and the framing of the referendum question. In this process, they have to work to constitutionally defined timelines involving publishing and gazette of the amendment bill. Timely completion of this process by the end of December 2018 will trigger the 2019 process. The 2019 process involves publishing and gazette over a six months period, fulfilling the constitutional requirements for holding the national referendum, undertaking public education and mobilization broad-based support for a peaceful and successful referendum. 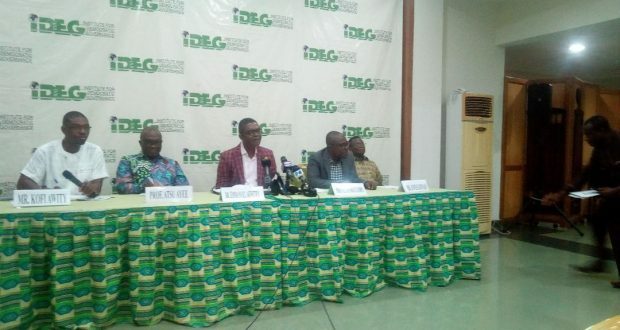 At a press conference in Accra, organized by IDEG on the theme: Amending Article 55(3) of the 1992 Constitution: Process and Implementations for Local Governance Reforms, the institutes Executive Director, Dr Emmanuel Akwetey said the prohibitive Article constitutionalized the winner-takes-all politics and exclusionary governance that has intensified the polarization and politicization of the nation. Dr Akwetey indicated that his outfit has been monitoring the debate on whether holding multiparty local government elections in 2021 rather than in 2019 which defines the 24 months the NPP pledged to get MMDCEs elected is evidence that, the President and the NPP have failed to deliver on their promise. He told the press that the Institutes advocacy is meant to tackle the recurrent turbulence and threat of electoral violence in the presidential and parliamentary elections and to improve peace, national security and democratic stability. He added, “We urge all stakeholders to support the effective and timely implementation of this momentous decision in both parliament and the national referendum. The amendment of this important Article would strengthen democratic stability, developmental governance and accelerated transformational and inclusive local economic development. For his part, Prof. Ransford Gyampo, Director at the Centre for European Studies (CES) at the University of Ghana stated that government’s lack of good communication skills is the cause of the on-going debate which seems to indicate that it has failed on its campaign promise to hold multiparty election of MMDCEs in 2019. According to him, the NPP government must come out to explain to Ghanaians the reasons for the postponement of the MMDCEs election. This is because if the general public is not made to understand the broader vision and strategic nature of the President’s decision, implementation of the decision to amend Article 55(3) will be frustrated.